Great colorful looking dish! Well done! Yum! Looks really good Sylvie. 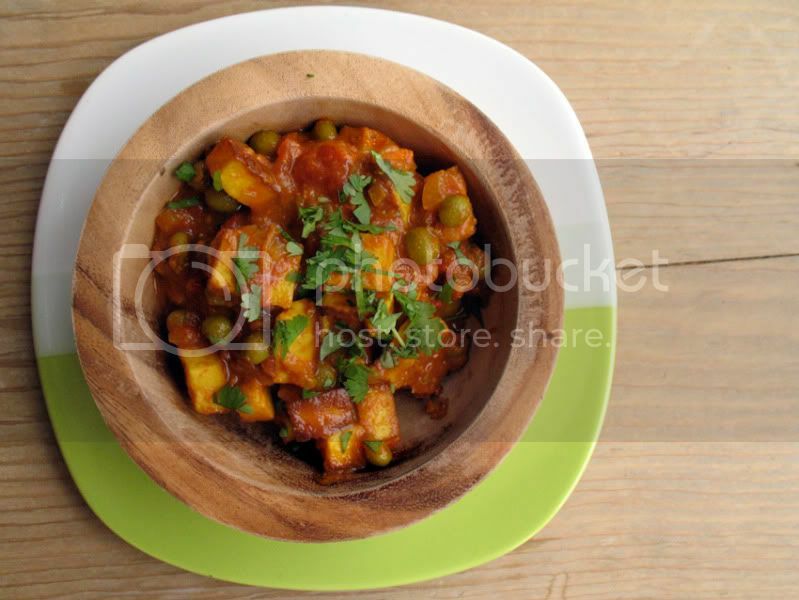 I love your wooden bowl, what a beautiful way to plate the paneer - which also looks delicious! Looks delicious Sylvie! I love vegetarian food! I do wish I could find paneer cheese here. I only recently discovered it but have to make it myself. This dish sounds right up my alley!! hey sylvie ...it's 100% Indian recipe with the ghee n all........did you like the flavor of ghee?? Katerina, when I opened my cupboard to look for a bowl to photograph the meal in that was the first one that caught my eye and I thought I'd go well with the curry. Unfortunately I only have one of them and it's also not very big, but it worked well for the picture. Marie, me too. I find that I eat less and less meat these days. I'll never be fully vegetarian I guess, but I hardly really cook meat at home anymore. Val, I've got some great Asian shops around the corner that sell all Asian ingredients I could possibly need, but my friend makes her own paneer as well. One of these days I'll give it a go. Sangeeta, I have to admit to using veg oil as I didn't have any ghee in and didn't have the patience to clarify my own butter. I do like the taste of ghee though. Thanks for the link as well. I'm off to check it out now. I'm sure you've got some cracking recipes on there. I'm not sure that my local megamart will carry the paneer cheese or ghee. Lucky for me there's an Indian market just down the road. Because I can always use a new way to eat my veggies, especially in the summer. I need to find some paneer, because this sounds wonderful! Oh this looks tasty. 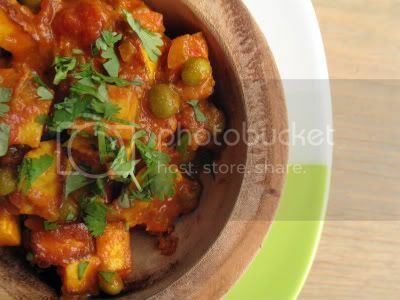 I must admit I have never tried paneer before but I will definately make the effort to try it out soon, this looks like it could be a nice first recipe to try it with. Thanks! i love indian food but would you believe i've never tried paneer? Thanks for sharing this delicious recipe Sylvie, it was a great success. 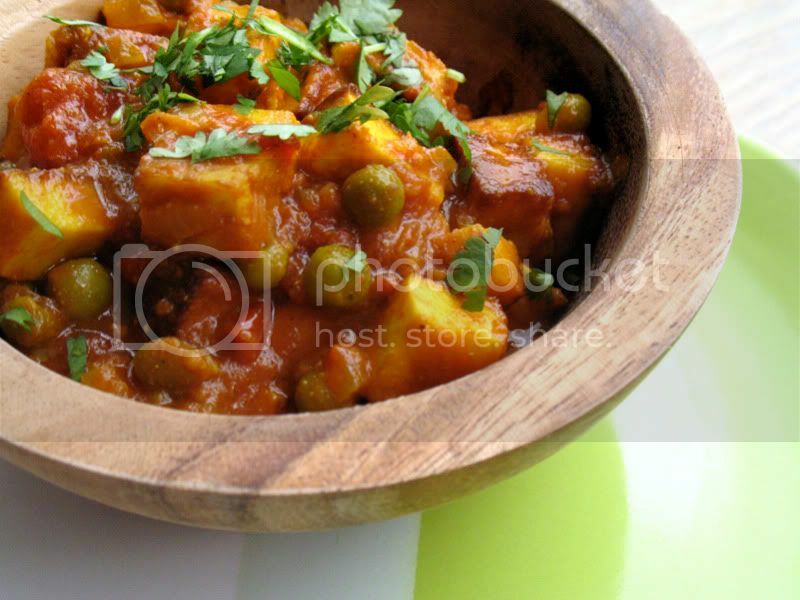 The easiest muttar paneer I have made, and the tastiest. I just made this for supper - added carrots and parsnip, but otherwise pretty much followed your recipe. Absolutely delicious - thank you.